Serious Sam HD: The Second Encounter was delisted from Xbox Live Arcade between September and October of 2015. It was also included in the digital version of Serious Sam HD: The First & Second Encounters and The Serious Sam Collection. These compilations are also delisted. The Second Encounter was delisted as Mastertronic Group went into Administration in November of 2015. As of April 2016 the demo version remains available on Xbox Live Arcade. Continue reading for the whole story. 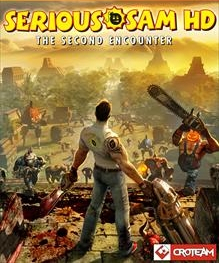 On June 25th, 2009 Majesco Entertainment announced that they would be publishing Serious Sam HD: The First Encounter for Xbox 360 “in partnership” with a fledgling Devolver Digital. The original announcement called for a “late summer 2009” release but the game was pushed back to January 13th, 2010 for both the US and Europe. Serious Sam HD: The Second Encounter was released on September 22nd, 2010 again by Majesco and Devolver Digital. By early 2011 Majesco was no longer involved in publishing Serious Sam titles. Devolver Digital moved on to work with Mastertronic Group to bring Serious Sam HD: The First & Second Encounters to both digital (US, EU) and retail (AU, EU) release in late March of 2011. Devolver and Mastertronic continued working together to release digital versions of Serious Sam 3: BFE and Serious Sam Double D XXL on Xbox Live Arcade and PC in 2013. Later that year the two publishers released The Serious Sam Collection featuring The First and Second Encounters, Serious Sam 3: BFE and Serious Sam Double D XXL. The collection was again released digitally and at retail in Europe and Australia by Mastertronic Group. The physical edition was released in the US by Maximum Games. All editions were released in late July of 2013. As of April 2016 all titles remain available on PC via Steam with Serious Sam 3: BFE also available to download on PlayStation 3. Trial versions of Serious Sam HD: The First Encounter and Serious Sam HD: The Second Encounter remain available on Xbox Live Arcade.